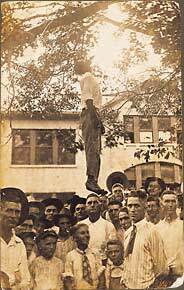 The lynching of Lige Daniels. Onlookers, including young boys. August 3, 1920, Center, Texas. Gelatin silver print. Real photo postcard. 3 1/2 x 5 1/2"